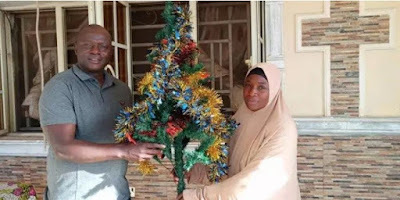 A peace ambassador and interfaith professional mediator in Kaduna state, Ramatu Tijjani has decorated the residence of Pastor Yohanna Buru, the general overseer of Christ Evangelical Church Sabon Tasha, with Christmas trees. In what many might refer to as exceptional show of love, Mrs Tijjani said the gesture was to boost better understanding among different faiths in the country. Mrs Tijjani, who is a specialist in conflict resolution in Africa, said the decoration of the pastor’s house with light, wreaths, stockings and ornaments is to strengthen peaceful co-existence and a better understanding of different faiths among citizens of Nigeria. "I observed that the Christmas tree is very vital to the life of every Christian all over the world, and that is why I bought it to decorate the pastor’s house, as a sign of promoting unity, togetherness and to wish all Christians worldwide the best of the season and happy new year in advance"
While commending the philanthropist for the gesture, the Man of God said: “Ramatu is the first woman who used her money to donate many things to churches, widows and orphans.” and prayed that God Almighty would bless her for donating the Christmas trees, new wrappers and food to the Christian needy.